James W. Goll shares about his upcoming Webinar, Healing the Wounded Heart, on April 23, 2019. James W. Goll Shares a powerful and timely message at Paul Cain's Memorial on March 2, 2019. James shares a brief peek into the book Praying With God's Heart and why it will make your prayer life more effective. In commemoration of the tenth anniversary of the passing of Michal Ann Goll, James introduces GEM Missions and resising funds for Solar Bibles. This is the 10th Dreamer's Park Dedicated to the memory of Michal Ann Goll on the 10th anniversary of her passing.This Dreamer's Park is near Poi Pet Cambodia. This is the 10th Dreamer's Park Dedicated to the memory of Michal Ann Goll on the 10th anniversary of her passing. This Dreamer's Park is near Poi Pet Cambodia. Steve Shultz interviews James Goll on what God has in store for 2018. This teaching grounds us in the Word of God to Wage Effective Spiritual Warfare over the Prophetic Promises of God. James gives us 4 Major Lessons to be Victorious followed by 7 Scriptural Insights to help us see the promise come to pass. Learn to Enforce the Victory purchased for us thru the completed work of the Cross of Jesus Christ and add a good measure of perseverance and faith to unlock the promise. This teaching grounds us in the Word of God in the art of pleading your case before a courtroom hearing in Heaven. God is presented as the Judge of All and Jesus Christ as our Righteous Advocate with the Father. Learn the biblical and historical background of the word “ekkelesia” and how it applies to our role in prayer and spiritual warfare. State your case that you may be proved right! For every problem there is a solution. The spirit of Jezebel has no place of influence in individual lives, families or society, unless there is first an vacancy created by an Ahab. But passivity does not have the final say. The Ahab Problem can be confronted and changed with the Jehu Solution. The warrior anointing of the Holy Spirit can fill and vacuum created by abdication. This message stands alone and yet is a perfect follow up to the audio and video message on Exposing Jezebel’s Influence. Five major Seer Prophets have graduated to be with the Lord in the past Five Years: Bob Jones, John Paul Jackson, Kim Clement, John Sandford, and now Paul Cain. Three of these were each placed into the ground on the same date of 2/22. What is the Lord saying through these graduations to heaven? What did these prophets carry that is yet to be fulfilled? How can we be postured to receive an inheritance and win for the Lord the rewards of His suffering? This message is full of revelation, insight from scripture and loads of experiential understanding. Learn the Ten Characteristics of the Jezebel spirit and reasons we should deal with this demonic force. This is one of the greatest Last Days Battles that we will face. Are you armed and ready? In this message given at the Annual HIM Prophetic Destiny Conference in January 2019, James shared on the theme of receiving “Fresh Bread from Heaven”. After building a scriptural foundation from Lord’s Prayer, James added understanding from the book of Exodus concerning the Manna that was given on a daily basis and the Bread of His Presence that the Priest put out daily. Then James proceeded to share 5 recent Prophetic Encounters from his own life. Revelations were followed by impartations on themes such as Presence Deliverance, Order out of Chaos, My Word is Alive and Active and much more. Highly energized and very inspiring, you will not want to miss this message. The enemy does not work haphazardly; he has tested strategies and methods that he has carried out and refined for centuries. But God has given you a remedy to break the power of the deaf and dumb spirit over your life! In this powerful message, you'll learn how to recognize and remove this spirit by the power and authority of Jesus Christ. Want to learn about the activity of Angels and the Last Days? Want to see what the Bible has to say about this subject? Want to learn from some encounters from James and others on this vital subject? If so, then this prophetic message was constructed with you in mind. 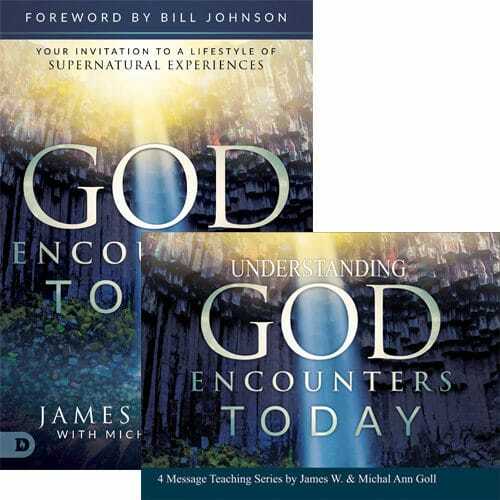 This message compliments that last chapter in the co-authored book Angelic Encounters by James and Michal Ann Goll. Yes, the supernatural activity oh heaven on earth increases as the day draws near. Get ready to weep! After Cindy Jacobs brought forth an amazing message of the “Crucible of Fire” at the Annual HIM Leadership Summit, she called Che and Sue Ahn, Patricia King and James Goll to the platform. This short 60 second video captures a deeply touching moment when Cindy washes the feet of her friend and fellow intercessory prophet, James W. Goll. This video might just “wreck you” as it has ten of thousands who have already watched this sacred moment. Do you want to grow in your relationship with God this year? I invite you to join me for Mentoring with James Goll, a new program that will help you grow exponentially in your prayer life, prophetic gift, and intimacy with God. It includes 72 sessions of in-depth training, an exclusive online community, and will help you walk in the fullness of God's purposes for your life. You will never be the same again! This is the first of a new monthly series of God Stories where I rehearse to you some of the past God Encounters I have been given over my lifetime. This event took place in May of 1989 at Longview Lake outside of Lee’s Summit, MO when I was on staff with Mike Bickle, Bob Jones and others and the time of the birthing of the modern Prophetic Movement. In this powerful encounter, God graphically showed me the importance of two truths—believing God matters, and obeying the little thing matters! In this dynamic and fresh message, James shares illustrations and experiences that help us understand God’s wonderful plan for our growth and transformation through tests and transformation. Listen, be encounter aged. Your seemingly impossible circumstances will push you to new levels in God. Lou Engle relates stories and prophetic words that show that we are at a 70 year focal point in history. God is calling us, as He called Daniel, to fast and pray for the coming youth awakening. This dynamic message will strike deep into your heart. Listen and join the movement. Official CD release party of Never Alone. Watch as James interviews 3 prophetic leaders of the Next Generation: Matt Sorger, of Matt Sorger Ministries, Stephen Springer of Global Presence and Jon Hamill of Lamplighter Ministries. James asks each of these distinct leaders, “What is the Holy Spirit speaking to you about 2018 and beyond?” You will be challenged and encouraged to grab hold of ALL that God has for you this year—as each of these fruitful sons in the faith to James share what God is declaring to them. 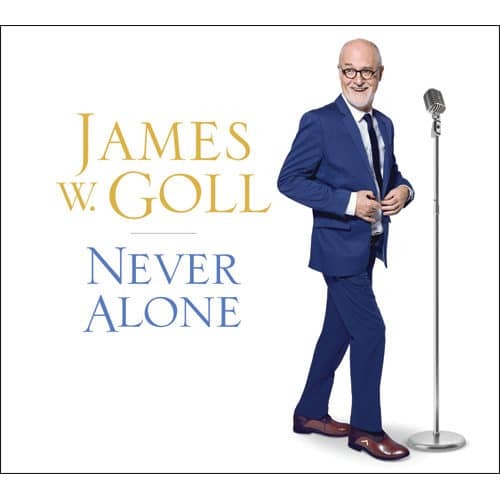 A preview of the track What the World Needs Now, from James Goll's New Album, Never Alone. In this fresh message, James brings us Five Clear Prophetic Words that he believes are vital for the future and the days in which we now live. James expounds on The Days of Acceleration, a time where the Knowledge of the Glory of the Lord abounds, a new vocabulary being released for the Prophetic Movement and much more. You won’t want to miss this one! James shares behind the scenes stories of why he was compelled to sing again. Never Alone contains 11 Tracks of Inspirational Cross-Classical music of life, love, family and devotion to God. Watch and tell others! 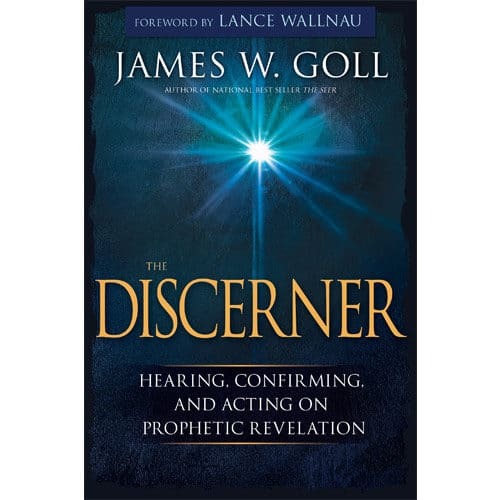 Jame W. Goll gives a candid 60 second overview of his new book, "the Discerner". He removes the myths and mystery of knowing, hearing and understanding God's day to day direction and communication with eack one of us. In this powerful webinar teaching, James Goll gives presents a choice that each of us can make when facing turbulent times. God has called the church to be a light in the midst of darkness, and to forcefully hold up the shield of faith instead of caving in to fear. This message will challenge you to stand firm and boldly radiate the love and glory of God to all those around you. This rousing message was presented by James Goll at the 20th Annual Women on the Frontlines Convention in Phoenix, AZ. James noted the strategic 50-year demarcations taking place in 2017, while sharing the background and birthing of the WOFL movement. Shifting perspective into the future, he invites us to crossover from the 500th anniversary of the Great Reformation into the Beginning of the Great Transformation. You were made for such a time as this! Did you miss the School of Kings that was held at One Stone Nashville with Jon & Jolene Hamill and James W. Goll? You can still view it at Kingdom Flame. Do You Know the Seven Spirits of God? In this powerful teaching, James unpacks the seven distinct expressions of the Spirit of God. Combining quotes from church history, scripture and prophetic interpretation, James brings understanding to the 7 Spirits of God. Learn how you can be used to carry these dimensions of God's Spirit into every sphere of society. After studying these dimensions for 30 years, James finally has felt released to express this vital message. You won't be disappointed! 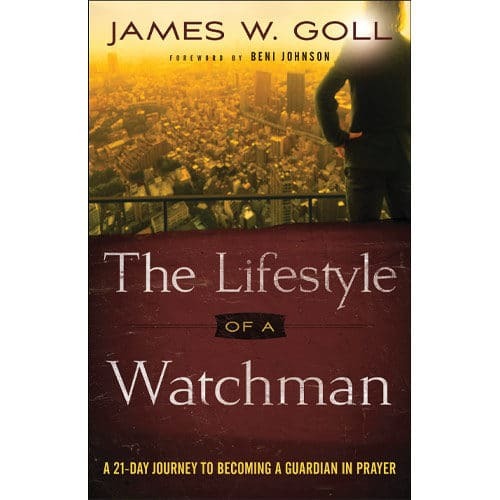 James Goll is the featured guest on Jewish Voice with Jonathan Bernis, They discuss the book The Lifestyle of a Watchman and the importance of praying for Jerusalem. In this powerful message, James Goll unpacks an intercessory encounter in which he found himself declaring prophetically, "It Is Time for the Lion to Roar!" This has profound implications for today as we approach the 500th anniversary of the Great Reformation. The Lion of the King of Judah is roaring once again, a battle cry that we are invited to join, resulting in the enemy's defeat and the greatest harvest of souls the world has ever seen. Watch this message and then pass it on to others—and let the lion roar in your life! Join James as he shares the vision of The Lifestyle of a Watchman book in great detail, showing how you can become a guardian in prayer. You will be inspired to take on the characteristics of an effective watchman—as evidenced in the lives of Abraham, Anna and Daniel. Take your place on the Walls—no one can take your place as you change the course of history! James shares in a very personal manner some of his most Extreme God Encounters in his lifetime that have been defining moments to help shape him into who he is today. You too can have “Defining Moments” that alter the course of your life. Why? Because God Encounters Are for Everyone! James shares how the life of Daniel—in honor, integrity and prayer—is a model for us to follow today. Rober Hochkin and Darren Stott discuss some of the most common traps of the enemy that work to limit your peace, joy, power and effectiveness; AND the simple keys to avoid or overcome them. Join me and my guest, Darren Stott from the Seattle Revival Center, for this Men on the Frontlines Raise The Bar event! You’ll also hear prophetic words from James Goll, Ryan LeStrange, and more. James shares highlights from the book "The Lifestyle of a Watchman"
In this unusual message by Michal Ann, she prepared homemade bread in front of everyone, telling stories from her mother and grandmother as she shared on "Faith of Our Mothers". Repentance came. Hearts were healed. Released at one of the first Women on the Frontlines Conferences in Nashville, TN, this homespun tale will impact you at your very core. What really “Moves the Hand of God?” In this message, James brings us jewels from church history and an abundance of biblical content mixed with his usual off the cuff commentary that combines to make this a penetrating message. William Booth, founder of the Salvation Army was asked this very question. He responded by scribbling two words on a scrap from a brown paper sack: “Try Tears!” This message goes beyond mere mechanics and into the heart of a matter. Join compassion to your prayers and watch whole atmospheres and cultures be transformed. This foundational but revelatory message is based on a dream that James was given in answer to a specific prayer. The Holy Spirit spoke to James, “We have had Purpose Driven Lives and now we have Presence Motivated People. But what we need for the days that are ahead are Values Anchored Believers.” This message sheds light on how you can live a fruitful and successful life in the days that are ahead. Join James as he shares stories, testimonies and teaching that will root and ground you into the rock of all ages! It is Time for a Breakthrough! James Goll releases powerful proclamations in this potent prophetic message. What does a breakthrough look like? Where do the scriptures point to breakthrough? Is this breakthrough for you? You will be encourage you to rise up and seize the calling of the Lord for your life. It's about Time! James Goll joins Patricia King to share about "God Encounters" and how you can set yourself up to have a fresh meeting with God. Did you know that there are at least 129 biblical prophecies concerning the first advent of Christ Jesus the Messiah? Do you want to grow in your love for God and devotion to His Word? Do you want to get to know Jesus more intimately? This potent prophetic teaching will deepen your faith and commitment to Jesus as Messiah. How Have James Goll and Encounters Network Impacted Your Life? You Can Raise The Dead!